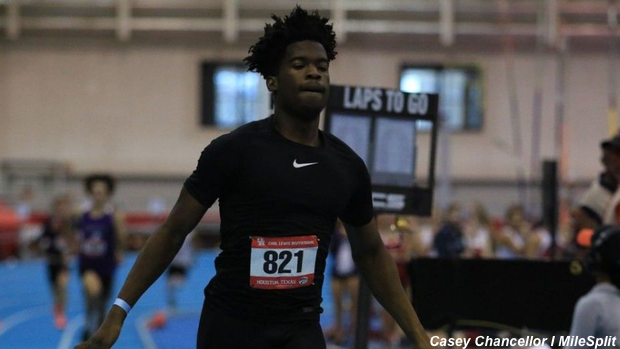 We knew there were possibilities of records falling at the Carl Lewis Invitational with the installment of a new track in their field house. Our hunch was right on point, because records definitely fell this weekend. The boards of the new track gave bounce to the legs and strides of runners, jumpers, and vaulters. The banked curves also played an important factor at improving the speed and times of several races. So, just how effective was the new track on the running events? Well, as we mentioned, there were several records that were broken. There were five total records broken on the track and two more in the field events that may or may not have been in result of the new track. Anna Hall (CO) tied the girls high jump meet record at 5-10 and DeAndre Stapleton Jr. broke an 11 year old triple jump record with a 49-5.5 jump, which is good for a US #1. But, there was more to the meet than just the records that provide more in depth insight as to how much the results improved this year over the history of the meet. Check out the stats below to see just how much of a boost the new track made in this year's track performances. Girls 400m - Seven girls ran under 58.0 this weekend. Only 16 girls have done that. Boys 400m - This year, four boys who ran under 50.0 including record setter Moyo Oyebamiji who set new mark at 48.88 and10 boys total who ran under 51.0. Previously, there were only a total of 10 to go under 50 and 31 under 51.0. Girls 800m - In history, there were only eight girls to run under 2:20. This year, there were four this year including meet record 2:11 by over 5 seconds for Bailey Goggans. Boys 800m - Historically, there have only been five boys to run 1:57s or better. This year, there were two 1:57s. Girls 1 mile - Historically, there were only six girls to run under 5:15. This year, there were two including #2 All-Time by Jordan Mathis. Boys 1 mile - There have only been seven sub 30s in the past and there were this year six this year and #3 All-Time by Owen Likens. Girls 3k - The has only been one girl in history to run under 10:30. There were two this year and #2 and 3 All-Time by Natalie Cook and Sophie Atkinson. Girls 60H - Nine girls went sub 8.80 this year when just 21 have done it previously. Boys 60H - Only 19 boys have run under 8.10 and this year, seven boys ran under 8.10 this year.